One of the most picturesque cities I have ever visited, Prague will astonish you with its beauty at every corner. 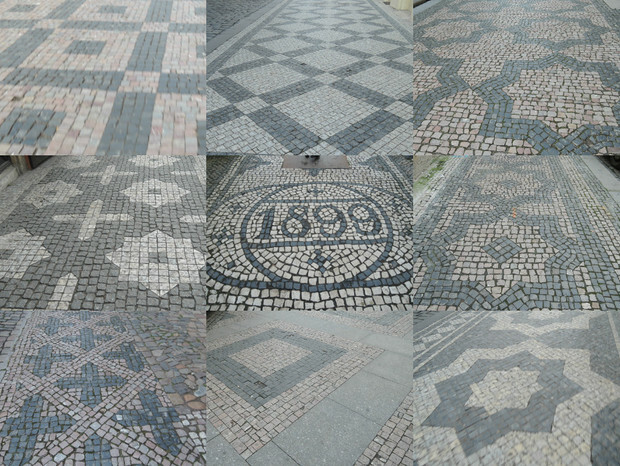 The intricate little designs on the cobbled stone pavements (which I am absolutely obsessed with!) and the history oozing out of every building façade gave an illusion that you have walked through a time portal into the Middle Ages. It’s got great food and snacks, churches and palaces, having once housed Premysl, Luxembourg and Habsburg dynasty. Did you know that it has also been the seat of Holy Roman Emperor at several points in time and the center of Hussite war. Get your all-in-one map for Prague! Consisting of white, grey, pink or charcoal cubes of sandstone, these pavements are a feast for the eyes but less for the feet. The history of how they came to be is not clear, but a lot of work was done by workers who laid them in manually. With only four days in the city, I can’t say that I have seen every bit. From checked squares to elaborate geometric shapes, they sometimes serve as the commemoration for a special event as well. With a bright orange-yellow exterior, this eye-catching hotel overlooking Wenceslas Square stood out starkly from it surrounding, reminiscent of the Grand Budapest Hotel. , its green wrought balconies, curved central façade framed with floral motifs are a redesign in 1905 by Alois Dryak. It is an excellent example of art nouveau style, popular in the late 19th century, inspired by natural forms and shapes. At the Northern end of Prague district 1, the Jewish quarter is home to some of the prettiest streets and building facades. One of my favorite buildings here (and of all times) is the Restaurant at the Old Synagogue. Built also in the Art Nouveau style (another name for it is Secessionist), this dark building contrasts beautifully with its surrounding, with its gold balcony fence, red roof and red-gold decorative panels around windows giving it a gothic fairy-tale, ethereal quality. Known as the alma mater of Czech Opera, this impressive rectangular-shaped Neo-Renaissance building was built in the late 19th century. It was originally due to open in 1881, but a fire destroyed most of it; however a campaign started for its reconstruction and within 47 days, and sufficient funds were gathered to rebuild it. Under Josef Schulz, the theater was able to reopen in 1883. Completed arched balconies to both sides, its front show a column supported the second story adorned with a Triga and 10 exterior allegorical sculptures on the top. The limestone dominant exterior is simple but intricate, with detailed sculptures and beautifully carved stone window. This is complemented by the colourful, intricate painted ceiling of the roofed balcony in gold and blue tones and the golden dome. The best view of the city is from the west end of the Castle District Hradcany, or more precisely, on the top floor of a Starbucks café to its right. This might sound a bit weird, but it’s true! With a small archway entrance to its terrace along the southern end, you can easily waltz in (since the actual shop is downstairs) and snap a few quick shots. If you are brave, you can climb onto the wide brick fence for that obstacle-free shot of the whole city. If you don’t like the idea of a photo with you dangling in midair with the city, then head down the right path that leads you through to Zamecke schody – patterned cobbled stone steps that lead you back down. With stepped patterns of black and pink sandstone, the wide, shallow staircase offers a great view of the city peeking between the brick wall to the left and the houses on the right. Prague Castle is more of a complex, with a series of structure that has been home to Bohemian Kings, Roman Emperors, and more. There are different parts to it, and to be honest, it gets a bit confusing, but it doesn’t stop you from admiring the architecture. On the other end of the Castle district, there’s an observation deck where you can view the city alongside the river. On the northern-most corner of Petrin Hill, the back of Strahov Monastery offers a panoramic view of the city far better than the top of the hill. Without the obstacle of foliage, you have a clear view of the city on a small landing. Nothing beats watching a city by the river, especially if the view involves castles, basilica and famous bridges. The view is arguably enhanced or obscured by a boat restaurant in the front; personally, I think it added to the scene quite well. A row of benches lined the river banks where you can just sit and absorb the city.